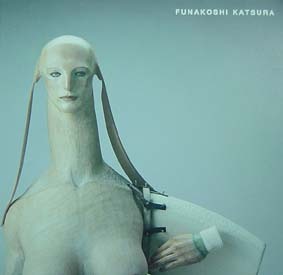 「森に浮くスフィンクス」2006　"The Sphinx Floats in Forest"
「遠い手のスフィンクス」2006　"The Sphinx with Far Hand"
Nishimura Gallery is pleased to announce the exhibition of the new sculptures by Katsura Funakoshi from 7th November to 9th December, 2006. Katsura Funakoshi is internationally renowned for his wooden sculptures with marble eyes, which are almost all life-size figures from the waist up. The latest sculptures which subject is "Sphinx" with both womanly breasts and a manly build express the beauty of the mystic body transcending the gender.